John Herman Randall Sr.'s New York Times obituary stated that, “Dr. John Herman Randall, retired clergyman and leader of the World Unity movement, died on Wednesday in his home at 527 Riverside Drive. His age was 75. Dr. Randall, who sometimes referred to himself simply as John Herman Randall, attained prominence in his youth as an orator, and later as an author of philosophical works. His ardent championship of the fellowship of all mankind had led him, like John Haynes Holmes, with whom he was associated from 1919 to 1927, to frequently discard the “Dr.” before his name. Born in St. Paul, Minn., he was graduated from Colgate University in 1892, and was licensed a preacher in 1888. Ordained to the Baptist ministry in 1895, he started as a pastor in Chenoa, Ill. For several years he was pastor of the Chicago Avenue Church in Minneapolis, and later of the Fountain Street Church in Grand Rapids, Mich.
Sarah Randall remained a firm traditionalist. John Herman Randall, during his Colgate years, evolved into a moderately liberal religious position. I’ve never heard which teachers, fellow-students and books at Colgate most influenced him in this direction. He determined to go, for his training in divinity, to the newly refounded Baptist Theological Seminary of the newly opened (1891) University of Chicago. Both had just been endowed generously by the firm traditional Baptist, John D. Rockefeller, Sr. But under the strong, founding presidency of the distinctly liberal Baptist Hebrew scholar, William Rainey Harper, both were launched with the best founding faculties that money could buy, deliberately set up to be fora for all current investigations and debates, where the whole sliding scale of students from fundamentalists to radicals could learn from diversity, and speak freely. Sarah Randall was not amused. She sincerely believed that such a course would lead to her son’s falling away from the Christian faith and to the damnation of his soul. She strongly urged him to go to a traditional Baptist seminary, and to depart forthwith for a lifetime as a missionary in China, where in isolation from the modern, liberal currents, the dangerous temptations that seemed to her to be sweeping true Christianity away in America, his faith might be preserved uncorrupted. (She was dead right about the futures of ministers in America and American missionaries in China.) My grandmother (not yet on the scene) said the battle between them was titanic, which she must have gotten from her husband. But she didn’t say that Sarah Randall was nasty, bitter, improperly threatening, personally cruel, or unforgiving when she lost. For she did lose. 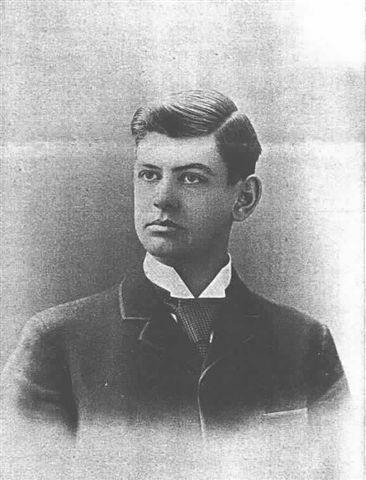 John Herman Randall did go to the University of Chicago’s seminary. In this he must have had the consent, at least, of his father, who after all paid the bills, though he had always left religious matters to his wife. He was a prize student at the seminary, where he was broadened and confirmed in his liberal religious position, as he would broaden and liberalize in further stages for the rest of his professional life. This more than forty-year-long evolution from a traditional Baptist to a non-sectarian, very liberal Christian was the core of his personal and spiritual life, the message of his successive ministries, and the function of his not uninfluential career in America. But he first had to be ordained by the Baptist board in Minnesota, which was mostly traditional, but open to considering candidates with the new convictions. That must have been a very anxious hurdle for him at the time. Decades later, when I asked him about it, he said, “No, they didn’t ask me if I was willing to be damned for the glory of the Lord. Quite early, they asked me if I believed in a personal Devil. I had to say, No, and that led to an animated and heated discussion that lasted so long that they didn’t have time to ask me if I believed in a personal God – which would have sunk me!” By whatever confidential vote, my grandfather was passed for ordination, but told that he would only be recommended to already liberal Baptist congregations. Fair enough? I wonder with what combination of pride and inner anxiety Sarah Randall attended her son’s ordination, not a sacrament among the Baptists, but a formal occasion. John Herman Randall and Minerva Ballard were married in Chenoa in 1896. I never knew her when she was young, but she was said to have been pretty, sprightly and frank. She remained a Baptist, but didn’t discuss how much her religious views had evolved with her husband’s. Her attitude was “irreverent,” not toward religion but toward pompous people and sentiments. She thought Minerva a bit much of a name, and preferred “Minnie.” When her first baby (my father) was learning to talk, he apparently combined Minnie with Mummy, and it came out “Money,” which tickled her, so she adopted it as the family mode of address for the rest of her life. She got along well with her two very different daughters-in-law. She was a kind and indulgent (but not “permissive”) grandmother. I suspect that she was a less indulgent but no less kind – and effective – mother, but her two sons never discussed that with me. My grandfather, still in his twenties, secured an excellent post as the minister of the Fountain Street Baptist Church, in Grand Rapids, Mich. It was a prominent church and a prominently liberal one. Baptists in the northern tier of states were more liberal than in the central belt of Northern Baptist states. There my grandfather became known for his thoughtful but often lively and sometimes humorous sermons (not so common then), on traditional and modern religious and moral themes, on political themes (moderately; he was never a prominent political minister, as Reinhold Niebuhr was) and on literary subjects. He, like a number of ministers since the railroad age began, received free passes from many railroads, and could go all over the country (though chiefly to the Middle West and Northeast) to give sermons in other churches and lectures from public platforms, notably at the Chautauqua Institute in westernmost New York state, where tens of thousands gathered in the summers to be informed and uplifted. Sermons and other writings of his were published. He became one of the few dozen American ministers who were nationally known voices and, they hoped (although they were not always in agreement), moral forces. No American ministers have won this place after World War II, save some black ministers in politics, as varied as King, Jackson and Sharpton. Some widely read professors, or some widely seen on television, approach this status today, but on the whole it is a social phenomenon that has vanished. During the War, he preached and wrote a great deal on it, as most American ministers did not. This included a book, “Humanity at the Crossroads.” He became a pacifist, and preached American mediation to end the catastrophe, which was popular in his church. But he remained an articulate pacifist after the United States entered the War in 1917, which was definitely not popular. He and his congregation mutually agreed that he ought to seek a new post. In 1919 he accepted the invitation of the Rev. John Haynes Holmes, an even more liberal, pacifist minister, to share a ministry in the Community Church of New York, which Holmes had recently founded. This was to be a non-denominational church, in effect an inter-denominational liberal Protestant church, for Catholics didn’t join and like-minded Jews were more apt to be members of the Ethical Culture Society. Holmes came to reach out to non-Christian religions, especially Hinduism, and celebrated a kind of Devali, the Hindu Festival of Lights. This made my grandfather smile. But he did not smile when a notable Hindu, Mohandas K. Gandhi, launched his Indian non-violent campaigns for freedom from Great Britain, in 1920-22. He spoke, wrote, signed petitions and raised some money on Gandhi’s behalf. Decades later I was proud to find, in a Gandhist ashram in South India, a copy of a public letter for the release of Gandhi from prison, signed by some American clergymen, Holmes and my grandfather among them. The 1920s were palmy days for America, including its churches, including the untypical Community Church of New York. From my grandmother’s accounts and from those of my mother, who knew him in that decade, John Herman Randall, Sr. had an optimistic, expansive, energetic, ebullient, humorous personality, not unlike what was asserted of his own grandfather, William Hannaford Randall of St. Paul, whom he never knew. He and his wife and their younger son, Robert, took two more trips to Europe, in 1924 and 1926, the latter getting tangled up in a revolution in Portugal. He became more and more devoted to summer camps in Belgrade Lakes, and at the end of the decade commissioned a beautiful, Douglas fir-lined lodge on the shore of Great Pond there. He had an Airedale dog, Rex, a gentle soul who once allowed my brother John, when very young, to fill his ears with Belgrade dirt. Although very busy, my grandfather continued to read and love literature. When Joseph Conrad died in 1924, not yet fully accepted as a classic English novelist, my grandfather, on non-successive Sundays, preached twelve sermons on Conrad’s novels and their ethical seriousness. He had not forgotten the horrors of World War I, and spent the decade trying, as a number of statesmen and public intellectuals did then, trying to educate the public and set up institutions that would make another world war impossible – a dream that seems so silly now, but which my grandfather and others then thought it ethically obligatory to pursue. In 1919 he published a book, “The Spirit of the New Philosophy,” preaching unity in all aspects of human life – unity within oneself, unity with nature, unity with God and “The Coming World Unity.” He also published a novel, “Soul on Fire,” whose protagonist wrestled with the problems of evolving his faith and saving humanity from future world wars He inspired a wealthy lady in his church to found and endow a World Unity Foundation, of which he became the head, and its journal, the “World Unity Magazine,” of which he became editor – in 1929. He had been at increasing odds with John Haynes Holmes, and was glad to leave the Community Church for an organization he could wholly control and direct. That year he also published a book he was very happy to write with his philosopher-son, my father, “Religion in the Modern World.” Perhaps he should have died that year. For then the Great Depression struck, building up slowly for over three years. The benefactor of World Unity lost so much of her money that she had to withdraw all the pledged funds, and the foundation and magazine collapsed in 1931. Education: Colgate University, BA, 1892; University of Chicago Divinity School, 1893-1896. Publications: The New Thought movement: first in a series of sermons (1908 or 1909); A New Philosophy of Life (1911); The Culture of Personality (1912); Humanity at the Cross-roads (1915); The Life of Reality (1916); The Essence of Democracy (1919); The Spirit of the New Philosophy (1919); With Soul on Fire; a novel (1919); The New Light on Immortality; or, The Significance of Psychic Research (1921); The Irrepressible Conflict in Religion (1925); (with John Herman Randall, Jr.) Religion and the Modern World (1929); A World Community: the Supreme Task of the Twentieth Century (1930); The Mastery of Life (1931). 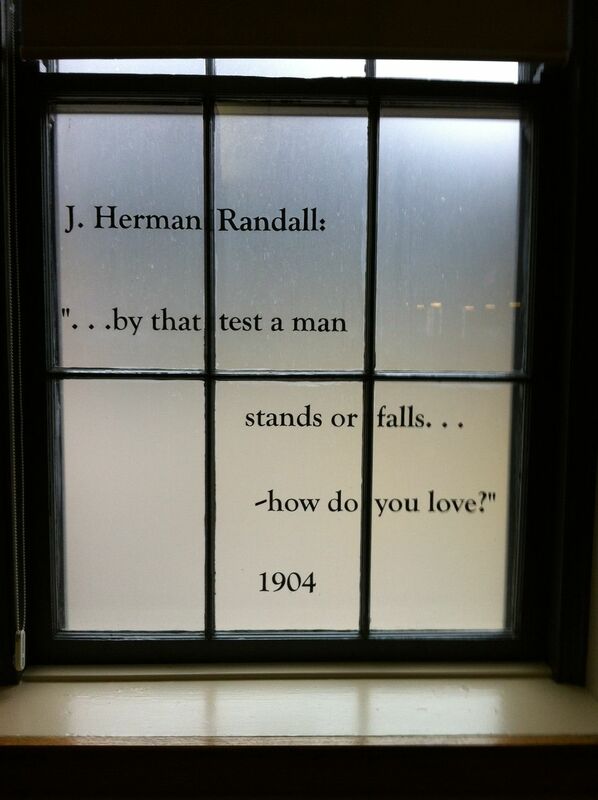 This lovely window at the Fountain Street Church in Grand Rapids, Mich., commemorates John Herman Randall Sr.'s tenure there at the turn of the 20th century. Our thanks to the church's current minister, Fred Wooden, for the photograph, and a significant clarification to this essay.